Freedom to roam or “why did the chicken cross the road?” We have let the chicks have their freedom during the daytime and their confidence has grown quickly. It wasn’t long before they ventured further than our own garden. They wander along the verge, and so Gabrielle has made up a sign to warn motorists, they also wander into neighbour’s gardens and one got detached from the others this week and was found climbing a neighbours stairs. Thankfully, none of the neighbours are bothered by this but we must monitor the situation to make sure their foraging doesn’t damage the gardens. And their ranging is taking them closer to the fields where the foxes approach from. We do wonder whether some kind of enclosure might be a good idea. “Free Range”, “Traditional Free Range” and “Free Range - Total Freedom” for poultry. I think ours are in the “Free Range – Perhaps a bit too much Freedom” category. I didn’t manage to sort out a similar definition for the French terms: “Poulets Fermiers”,“elevées en plein air” and “élevées en liberté”. A permaculture solution is a “chicken forage system” perhaps combined with a “chicken tractor”. Read more about the ideas in Patrick Whitefield’s “The Earth Care Manual: A Permaculture Handbook for Britain and other Temperate Climates” and I also found Bill Mollison’s Permaculture: A Designer’s Manual useful. Basically the idea is to fence off a sufficiently large area for the birds well-being and then plant it with trees, shrubs and other vegetation which will provide food naturally for the chickens. If fruit trees are added, the chickens will do much to reduce disease by eating bugs and larvae, and weed and fertilise the soil at the same time (The ECM pp 246-53). Designing such a system on our site will go on the list of things to do, and planting it will have to wait until winter now. 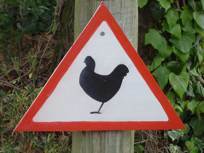 In the meantime, has anybody seen our chickens recently? your blog site is very interesting and inspiring - although I am not sure if you a suitable chicken parents - before you know it they'll be wandering home drunk at all hours of the night! thanks for mentioning the wood recycling project in Brighton - as you know there is a growing network of these social enterprises spreading throughout the UK. Our aim is to have them in every major town and city - all providing cheap timber suitable for virtually any DIY, building or (of course) permaculture job. if you check out our website on www.communitywoodreycling.org.uk you can see where the others are. 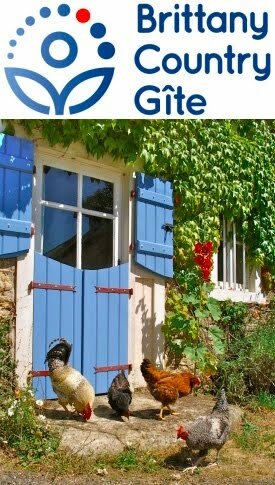 The gite looks idyllic (and seems too cheap for such a lovely location). I can't wait to stay in it (as long as you keep those rowdy, itinerant chickens away). I am the supplier of the original 2 black chicks, and the probable supplier of future babies to the brood. I have just had a batch of 9 chicks (as opposed to just 4 the last time). They were born 3 weeks ago, and I am very surprised at their growth rate - they are already nearly the same size as your little ones were when you took them from here (at that time they were 10 weeks old). I have decided that it is to do with the heat - I think that your babies used most of their energy keeping warm, as it was quite cold when they were born, whereas these new 9 have been lounging around sunning themselves on my picnic table and are just using their food to grow, grow.